Enbridge representatives chatting with the public after the meeting. 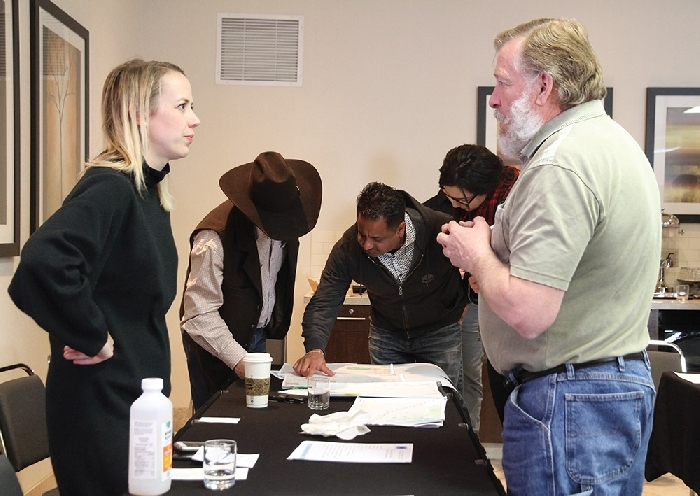 Pending regulatory approval in the U.S., Enbridge is hoping to start its Line 3 replacement in the Moosomin area in August—that was the message shared at a Moosomin Chamber of Commerce meeting last week where five representatives from Enbridge attended to speak to Chamber members about the project. “As it stands right now we are looking at starting construction in early August,” Joanne Bradbury, Strategist, Community and Indigenous Engagement, with Enbridge told the Chamber. “You may start to see some pre work happening in July. “At this moment our project leadership that is based in Edmonton is making those final decisions. “This is a cross border project, and we have regulators in the U.S. and regulators in Canada. In Canada we have the green light to build this project. In the U.S. it’s a little bit of a different story. Each individual state works through that regulatory process and we are still working through some of those items down in Minnesota, and that is what can influence what happens in Canada and the pace at which we build this pipeline. So if we do start construction here it will be in August. “There are a number of reasons why we do that and the most important is the environment. There are a number of environmental restrictions in spring and technically we can’t even get going until August. Bradbury attended the meeting along with Chad Morris from the Land Services department, Denny Hay from the Major Projects Construction team, and Les Scott and Whitney Thomas from Enbridge’s Community Engagement group. Bradbury spoke in depth about the project itself, and also what local businesses can expect and should prepare for, if the project happens this summer. “We have deep ties in Saskatchewan. We have been a part of this community for over 65 years,” said Bradbury. “The petroleum products we ship in our pipelines through Saskatchewan and across North America support economic prosperity and contribute to the lifestyle we enjoy as Canadians. “Our liquids and natural gas pipelines are unmatched in scale and diversity. We operate the world’s longest, most sophisticated crude oil and liquids pipeline system. We have more than 28,000 km of active pipeline and we deliver more than 2.2 million barrels a day to our customers in the U.S. and Canada. “In Saskatchewan, we have been here for over 65 years and we are proud members of this community. We have almost 300 employees that call this province home. From 2014 to 2017 we paid nearly $110 million in property taxes to Saskatchewan communities along our pipeline right of way. On average in the last couple of years our combined operating and capital expenditures have totalled over $187 million for Saskatchewan alone. “The Line 3 replacement program, which is anticipated to start this summer, will provide an even bigger boost to this province. “In terms of scale it is a massive project for Enbridge. In fact it’s the biggest project that we have ever undertaken in our history. It is a multi-billion-dollar project. It is quite significant as far as crossing the Canada-U.S. border. It will extend right across the province of Saskatchewan. “The project begins in Hardisty, Alberta and ends in Superior, Wisconsin. “This project is a critical piece of energy infrastructure that supports our economy and ensures a reliable and cost effective supply of energy. “The original Line 3 was built in 1968. The pipeline was built to the highest standards to the time. Unfortunately the type of coating that we used in the 1960s just didn’t stand up to time, so in 2013 Enbridge made the decision to do a full line replacement. “In late 2016 the Canadian Federal Government approved the Line 3 replacement program. “What we call this project is an essential maintenance program which will improve safety and reliability on our mainline system. This is not an expansion project. It is actually a replacement of our line 3. “Once Line 3 is built, the current Line 3 will be decommissioned in place. On the Canadian side we are going to build just over 1,000 km of Line 3 pipeline between Hardisty, Alberta and Gretna, Alberta. “We will construct 18 new pump stations in Canada and many of them will be here in Saskatchewan. Wherever feasible, we will be building those pump stations within already existing facilities. Bradbury said each construction spread will be 100 to 120 km long and to date they have built spreads 1, 3 and 4. Their focus this year is spread 2, and spreads 5-9. Moosomin is in spread 6. “If we do start construction this year we do anticipate that our in-service for the entire pipeline will be in the later part of 2019,” she said. Who will work on the project and where will the field office be? In 2017 our prime contractors for this project were OJ Pipelines and SA Energy,” she said. “The contractors are responsible for the majority of the subcontracts on this project. “For this year we have not yet selected our prime contractors. We anticipate a decisions on the prime contractors in the next couple weeks. As soon as we know we will let the Chamber know. “It’s also the prime contractors who decide where the 2018 field offices are located along the line. “When they select a field office they look for communities that have a number of services like banks and hotels and restaurants. Moosomin is definitely a contender for a field office but at this point it’s not my place to say where their field office will be located. “This is a fully unionized project, with welders heavy equipment operators, laborers. If anyone is interested in this project they should contact their local union hall. “This project in addition to all the skilled trades will have a number of other skilled resources, the heavy equipment operators, the welders, the laborers, the coaters, the surveyors, the line locators, the methodic inspection experts—and those are just a few. “The crews per spread will be around 800. So it’s a fairly significant crew. “We strongly encourage local inclusion and indigenous economic participation with our prime contractors. It is a key priority for us which means it is a key priority for the contractors,” said Bradbury. “We do try to hire as many local resources as possible and to procure our equipment and any supplies we need locally. “But when it comes to a project of this size and a crew of this size, we end up bringing folks from all over Saskatchewan and sometimes all over the country. Which means they need places to stay. There are no housing camps on this project. “We don’t co-ordinate any accommodations, but what we do have are lists, and a lot of them. So for each spread our construction team has lists of different kinds of services—accommodations, laundry, catering, supplies, things we think are going to be needed in the field. And as soon as they award the bids they start sharing these lists. Even recreational activities—they are shared with the prime contractors and then they share it with their crew. “Ultimately it’s the crew that makes the final decision where they stay. They choose what suits them best. If their family is coming to stay for a little bit they need to look for things like that. “They generally like to stay near the field office but some will consider staying a little bit further out. Some of these guys do have pretty impressive RVs so they may be looking for campgrounds within the area. “Our anticipated start date is August. Once we do get started, the working hours are 7 am to 5 pm,” said Bradbury. “They are bussed to the right of way at 7 am. They are moving around and getting to the field office before 7 am. Some of them will work later than 5 pm. That’s a long day. By the time they get bussed back to the field office, that’s 10-12 hours. “The shifts for this project are six days a week. They work Monday to Saturday and they get Sundays off. We do encourage local businesses to review your hours so you can benefit from the influx of workers in your area. “These guys like to get up and go for a nice big breakfast first thing in the morning. They are up and ready to roll at 5 am. Some of our inspectors have meetings that start at 6 am. “With a schedule like this, with one day off, most of these guys and gals can’t go home, so they will be looking for things to do on their day off, which is Sunday. So if you have a business that’s closed on Sunday, that’s a bit tricky for them. “Ideally we don’t want people based in this area going to Regina if they don’t have to. Regina has its own construction going on and they will have a crew of 800 there. We’re hoping that people will get their groceries here. Those guys camping need groceries, they need laundry, they need all sorts of stuff. “When you get off work at 7 pm and you started at 7 am you’re tired, so you aren’t necessarily going to run out and grab groceries and get ready for the next day, you may end up doing it on Sunday. “The other thing is that, especially in the summer months, when kids aren’t in school, families usually come and visit the folks that are working here. So they may be looking for things to do. I mentioned recreation activities earlier. Those are really good things for us to know about. “If there are different types of activities in the area, we’d love to hear about them and you can send that as well to projects@enbridge.com. “This is an interesting time as far as pipelines and the energy industry is concerned,” said Bradbury. “Many of these people are living away from home, they don’t have their comforts and their family. If you can make them feel welcome it really goes a long way. “The other thing is if you could be an advocate. This is a very importance safety and maintenance project and if you can let your customers and neighbors know that you support this project and it is bringing a lot of benefit, that goes a long way as well. “What does Line 3 mean for Saskatchewan overall? It means there’s going to be an estimated 9,000 temporary full-time jobs during the three years of construction in Saskatchewan,” said Bradbury. “That’s 2017, 2018, and 2019. And that doesn’t include any of the indirect or induced benefits that will come from local restaurants or the hotels and campgrounds and all the accommodations that will be used. “We are also making real efforts to hire locally and procure our supplies and equipment locally. In fact most of the line pipe that is used on this project comes from Evraz in Regina. “So good working relationships with our community, including the business community, is essential to our operations and our major projects. “At Enbridge we live by the values of safety, integrity and respect and we are committed to ongoing, open and honest dialogue as we move into construction. We really want to hear from you. If something is good, tell us. If it’s not so good, definitely tell us. We need to be held to a standard and if things start to go sideways we need to know. “We have a pretty strong construction team and they have zero tolerance for not the best conduct in communities. These communities are going to be part of Enbridge long after Line 3 is all said and done, so it is essential that we know what is going on and we manage it immediately. “Pipelines, in our opinion, remain the safest means of transporting liquid fuels over a distance,” concluded Bradbury. “Over the past decade we have transported more than 15 billion barrels of crude oil with an exceptionally safe delivery effort, but we know that even we need to continue to improve and we will.